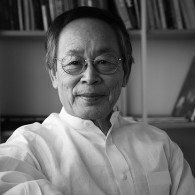 Hoichi Kurisu studied landscape design and construction under Kenzo Ogata in Tokyo, Japan. Kurisu was appointed Landscape Director for the Garden Society of Japan (Nihon Teien Kyokai 1968–1972), during which time he supervised construction of the Portland Japanese Garden. In 1972 he founded Kurisu International, Inc., which has since designed and built a number of gardens including the Anderson Japanese Gardens in Rockford, Illinois, Roji-en Japanese Garden at the Morikami Museum and Japanese Gardens in Delray Beach, Florida, the Japanese garden at the Dubuque Arboretum and Botanical Gardens in Iowa, and the Japanese garden for Samaritan Lebanon Community Hospital, in Lebanon, Oregon, which was the winner of a 2006 Healthcare Environment Award for Landscape Design.